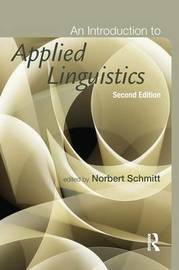 An Introduction to Applied Linguistics, Second Edition provides a complete, authoritative and up-to-date overview of the state of the field. Each of the 15 chapters offers an extended survey of a central element of Applied Linguistics and is co-authored by two leading international specialists, thus ensuring a full and balanced treatment of the topic covered. The book is divided into three sections: a description of language and language use; essential areas of enquiry; and the four skills and testing. An Introductory chapter familiarises readers with key issues and recurrent themes whilst hands-on activities and further reading sections for each chapter encourage practical analysis and wider reading. For this new edition, each chapter has been fully revised in line with new research and thinking in Applied Linguistics. With its accessible style, broad coverage and practical focus, this book is ideal for students of applied linguistics, TESOL, and second language pedagogy as well as practicing teachers and researchers wishing to update their knowledge. Norbert Schmitt is Professor of Applied Linguistics at the University of Nottingham.